Are Bulls’ hearts and minds into this Game 3? The Bulls gathered in Philadelphia Friday morning knowing what they have to do physically to beat the Philadelphia 76ers and retake home-court advantage and control of this first round playoff series tied 1-1. “We’re a help defensive team,” said Carlos Boozer. “We can’t let our guards be on an island out there by themselves. We’ve got to show our help, fake our help. We’ve got to rebound the ball better, get back in transition better. So, yes, the Bulls know who they are and what they have to do. But can they push themselves to do it? The playoffs, after all, are mostly about doing what you always do, but harder and more relentlessly. Yes, there are subtle adjustments to make. But they never work without the extra effort. And much of that is guided by your mental commitment. A week ago, the Bulls were preparing for a two-month playoff run with what they believed was a legitimate chance to win the NBA championship. No one, even in Philadelphia, picked the 76ers to win the series, perhaps not even a game and certainly not two. Now, the Bulls are at best considered even to get out of this round and considered by no one to have a chance to win the championship. So if you are a member of that Bulls team, can you put as much into this series and these playoffs as you felt you would before? No one is going to give up. No one is going to give less than they think they have. This is not a soft Bulls team. They are competitors. They could not have done what they did the last two seasons otherwise. But do they have the same drive? Really, can anyone in these circumstances? Bulls players before shootaround Friday morning all said they were ready to move forward. But we’ll know more by what we see than anything they say. I suspect they don’t even know themselves. Because when your heart is broken you just aren’t the same for awhile. The Bulls were in love with this season because of who they were and where they felt they were going. No one can have quite the same feeling. But they pay you the same for every game you play and everyone expects your best. But when you give it, you also have to be asked at times if it was really your best. Indeed, there are playing issues without Derrick Rose that have much been discussed already, the Bulls guards and scorers getting more trapping pressure from the 76ers, fewer open shots with Rose no longer there to draw two defenders, the 76ers suddenly the considerably more athletic team. Collins said he expects the Bulls to now go to Luol Deng and Boozer, especially the latter after Boozer got just 12 shots combined in the first two games. 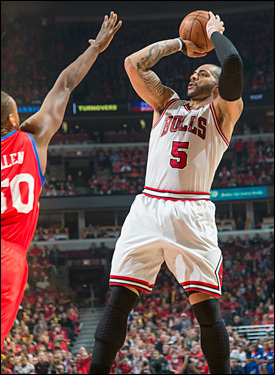 “We’d all love to get the ball in the paint a little more,” said Boozer. “But the biggest thing is our defense. For me, I’d love to get the ball in the paint, work a little more, do a little more pick and rolls. We definitely got to go inside more. It’s Thibs, his offense, his defense, so we run his plays. But as long as we do it with more determination we’ll do better. But now the 76ers are the ones who can do something whereas a week ago even as they planned to come and play hard they had to believe they didn’t have a great chance. “We don’t want to get into a halfcourt scrum with Chicago,” said Collins. “They are bigger and stronger than us. The more open court we can make it the better. “Game 1 they played their game,” noted Collins. “Game 2, especially in the second half, we got it more to our style. I think our fans are excited. We left here fan appreciation night there were 5,000 empty seats and we lost our fourth straight home game. I want it to be raucous. I want to reach out to our fans. “I don’t want this to be a situation to where they (76ers’ players) getting tight with what the consequences are,” said Collins. “I learned a long time ago from Michael Jordan greatness doesn’t fear consequences. I do feel we have a chance. I feel our players are confident. We’ve played this team pretty well over the last two years. The first time we played this team (last season) they beat us by 47 points right before Christmas. The next time we played them, we beat them here at home and then we beat them in Chicago. Now we’ll see if the Bulls feel they still have enough to show the 76ers who should be advancing.